This section is for all approved QHI locations that want to "Private Label" QHI trademarked marketing materials or store-fronts. All you have to do is select the merchandise you are interested in and buy it online. NOTE: The items listed in this portion of our website have been approved by Quality Home Improvement, Inc. ™, anything else from this section must first be approved by QHI and require written authorization. * Vehicle Wrap Hoods, Wall Logos, Front Store Glass Sticker, Hats & T-Shirts. Click here - to download this asset / this is a JPG file. * Website, Business Cards, Vehicle Wraps. * Video Presentations, Business Cards, Vehicle Wraps., T-Shirts & Collared Shirts. Click here - to download this asset / this is a PNG file. * Video Presentations, , Business Cards, Vehicle Wraps. * Video Presentations, Website, Social Media. Click here - to download this asset / this is a MP4 file. Don't want to do all the printing, negotiating, running around or wasting a lot of time getting the necessities done for your business?, ... Let us do that for you. Pick and choose what you want us to do for you. This very nice QHI contract paperwork folder holds all of your customers contracts, marketing materials, business card and welcome letter all in one. We can add your address to these folders. This 6" X 5", Glossy Card should be part of your PAPERWORK FOLDER, its a great asset to give out at canvassing, home shows and is a great conversation piece because it lists many of our products. This 8.5" X 11", 5 Piece Welcome Paperwork package should be part of your PAPERWORK FOLDER, its a great asset to give customers in their home, it shows our appreciation and tell's them what happens next if they are going solar. In addition, on the 5th page, it talks about getting referrals. These are approved 11" X 14", QHI CSLB contracts and MUST be used only by licensed CSLB HIS sales representatives within your sales organization. Having these contracts on hand in your office will save you lot's of time and money. Your contract bundle comes with all (5) contracts - 2 piece NCR. Want to stand out in the crowd? ... Do what your competition is not doing, get all of your sales representatives QHI collared shirts. A solid-colored polo that is versatile enough to be worn in and out of the sales presentation. The Ben Hogan Men's Short Sleeve Horizontal Texture Solid Polo is both dapper and tough thanks to performance attributes like PowerBlock UPF 15 solar protective barrier and PowerWick moisture absorption. Never forget to put a yard sign on your customers lawn right after the sale, doing this get's your customer excited and engaged, ... Besides its the BEST advertising you can ever do because all the neighbors will see and inquire with their neighbor. In addition, people driving buy will see the yard sign and inquire. 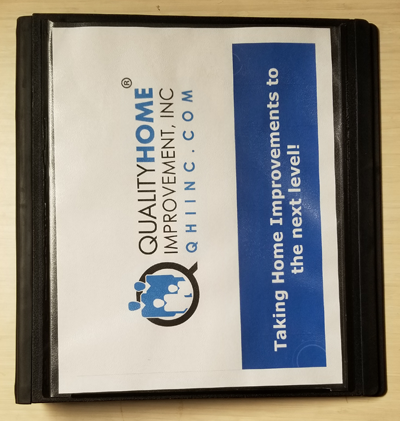 Every Sales Person on your team needs a QHI pitch book, each pitch book comes with the following products and comes in a very sturdy black three ring binder and clear page protectors. * Quiet Cool Whole House Fan. 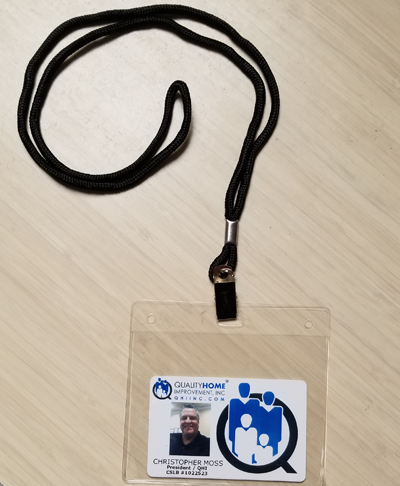 Look professional with a QHI Identification and lanyard. First impression is everything, the QHI Identification will have your picture on it, your title and HIS license number. The plastic case is also durable and a good place to put your CSLB HIS license as well. Look professional with an official QHI Coffee Cup in your office. Everyone LOVES Coffee so why not give them a special QHI souvenir when they come down to visit you, or as a token of your appreciation when you win a sale. (72) Coffee Cups per order. Look professional when you are doing a home show, a swap meet or an official event. These vertical banners will also look great in shopping malls or in your office, ... The first impression is everything.